Here is the list of the boutique* bicycle manufacturers, ordered by their name (starting with T). If you want to find a unique bike that fits your personality, review this list. Ted Wojcik (pronourced woah-jik) worked on gas turbine engines and helicopter transmission systems during the Vietnam War where he gained extensive engineering and mechanical experience. He worked for several motorcycle specialty shops in New England and became one of the leading motorcycle racers in New England racing on a National level. He got his start when he met his future wife, Sue Abrahamson, an avid cyclist At 5’2”, she was having a hard time finding a bike that she could ride. Having already learned the art of motorcycle frame fabrication through his racing experience, Ted ordered tubing from a local bike shop to build his wife a bicycle. Already an accomplished welder, Ted decided to try his hand at creating bicycle frames. Built in Ted’s basement, the next frame was sold before it was completed. Ted figured this was a good sign so he made a few more frames, selling them locally. He worked out of his home until 1990 when he set up shop dedicated to producing more frames. After more than 25 years of designing and manufacturing bicycle frames, Ted is revered as one of the masters of the trade. His bicycles have won medals at USCF championships, NORBA events, Tour Du Pont, the Pan-Am Games, and World Champnship Track events. Today, Ted Wojcik build bikes in New England. He still cuts, welds, brazes, and paints the frames by hand. Ted Wojcik T.I.G. Welded Rensport: -T.I.G. welded; so tight and clean. -Engineered to reflect classic road geometries -OS 1 1/8″ top tube and 1 1/4″ down tube for a stiffer front triangle for control during sprinting. -Supple rear triangle delivers the feel and compliance for which we ride steel. -Constructed with a custom selection of Columbus tubing to meet YOUR riding style. Thrive Cycles gravel road bike. Located in Missouri, United States, the company was founded by Darrell Williams. Located in Portland, Oregon, United States, the company was founded in 1990 by Dave Levy. At the time, titanium was an exotic metal still in the nascent stages of common use as a bicycle frame material. 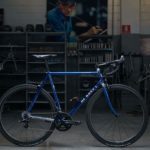 Over the dozen years that followed Dave built hundreds of frames, forks and components as the Ti Cycles brand diversified into a full line of production bikes including road, cyclocross, and mountain bikes in titanium, steel, and even some aluminum. Ti Cycles caters to all levels and all disciplines of cycling, from the enthusiast weekender to professional racers around the world. 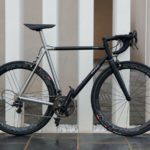 In addition to offering completely bespoke custom frames, forks, and components, Ti Cycles has developed production-built bikes and parts in both steel and titanium. Through a quarter century of continuous operation the company has built thousands of frames for a diverse roster of riders. Dave has himself been an avid cyclist for decades and has some 35 years of cumulative experience in the bicycle industry. A licensed USCF and NORBA racer, experienced tourist, commuter and tandem rider, Dave appreciates the bike’s application for sport and in every day life. His passion for cycling in all its forms affords Ti Cycles customers an experienced resource to guide them through the process of building their dream machine. Ti Cycles Local Hero. Built from from Columbus Zona tubing, this lightweight steel road bike frameset is built for 700c wheels. A classic, utilitarian design adaptable to use as a single speed, with internal geared hub, or in a classic derailleur setup. * Traditional level top tube frame design. * Traditional split stop brake cable routing makes for easy maintenance and stronger rear braking. * Traditional down tube braze-ons for shifter or cable stop bosses. * Traditional reinforced 1-1/8″ head tube. * Traditional horizontal dropouts with adjusting screw and derailleur hanger. * Removable aluminum seat post clamp. * Clearance for most 28c tires with fenders and long reach brakes. * Perfect for drop bars or flat bars. * Standard low gloss black powder coat with gloss black decals. * Handmade fork with sloping crown, straight blades and fender eyelets. * Available in 2cm sizes from 50-62cm. * Available as a complete bike with any component build. Perhaps no other company epitomizes Italian bicycles like Tommasini. Tommasini is truly made in Italy with 100% of production coming from the small shop in Grosseto, Italy. Here in 1957, Irio Tommasini began his commercial endeavor building exquisite steel road bikes known for exceptional quality, performance and beautiful paint and finish. Irio Tommasini has been a master frame-builder since 1948 and in his time was a successful rider in the world of racing. Today, Tommasini Bicycles still produces artisan quality steel road bikes but has expanded to high tech materials like carbon, titanium, aluminum and state of the art stainless steel using Columbus XCR tubing. 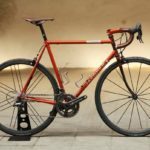 VLC3 is Tommasini’s best racing bike. It is built with tubes designed by the Tommasini Factory, which are very different from industry competitors, in respect of its philosophy of classicism of the shapes. In fact, they confer the right stiffness and lightness to exalt response while keeping superb handling on all kind of routes. The Tommasini VLC3 is the latest carbon creation and newest Velocista version. The VLC3 is a carbon wrapped construction using carbon tubes designed exclusively for Tommasini. All the tubes are carefully mitered, joined with aerospace adhesive and then wrapped with carbon laminates. With this method it is easy for Tommasini technicians to build a carbon frame specific to body measurements creating a custom carbon frame. * the monobox perfectly copy the bottom bracket to confer more stiffness. * The hidden set is still 1 1/8″ – 1 1/2″, consequently the matching fork is the FKTOS 1 1/2″. * Thousands of custom paint options. The company is located in Gundelfingen, Germany. All the bikes are designed and manufactured in Gundelfingen. Depending on the model, the frame tubes come are from Italian premium steel maker Dedacciai, the frames are manufactured by European or Taiwanese frame builders. All subsequent manufacturing steps happen in-house: the incoming frames are thoroughly inspected in quality control department, before they are further processed in our own powder coating shop and they become sandblasted, powder coated in the customer’s requested color. In addition to the 10 standard colors, a wide range of RAL colors is available for color selection. tout terrain bicycles are carefully assembled by hand. Thtey build urban/touring bikes as well as e-bikes. tout terrain Grande Route XCR. The Grande Route is a classic Randonneur, which enables long-distance cyclists to cover great distances at a sporty tempo without missing with a comfortable seat position. XCR is the exclusive special edition of Grande Route made of stainless steel constitutes the fulfillment of a long-cherished dream. A bike with integrated luggage rack, constructed entirely from stainless steel. This bicycle incorporates everything that is aesthetically pleasing, refined, and high-quality. The ultra-light Columbus XCR tubes make the Grande route XCR a cycling machine for the long-distance specialist with a taste for the exceptional. The bike will be produced as a limited-edition only on a pre-order basis. Founded in 2005, Triton Bikes is located in Moscow, Russia. They build titanium frames and components made ​​by hand. They can ship worldwide in 5-10 days. True Fabrication Bicycles was founded by three friends (Cody, Clark, and Cole) who have a passion for cycling and steel. They have been building custom frames in Austin, Texas, United States since 2005. They started out just building 29er frames for themselves, but now offer road, cyclocross, mountain and commuter bikes. Tsubasa “The Bee” Road Bike. Based in London, United Kingdom, Tsubasa is a small bespoke framebuilder that works exclusively with carbon fiber. Every part of the frame is fashioned in Tsubasa’s London workshop. The company is located in Piacenza, Italy. T°red Arachnide A01RR. Aracnide “RACE” has been developed specifically for races and racing use, combining titanium and uncompromising style. The frame’s markedly sporty geometry optimises its competitive performance and is particularly responsive and lively when attacking a climb out of the saddle, as well as providing comfort during long rides. The essential design produces exceptional accelerating and sprinting performance, enhanced by the aero carbon fork and fork mount and the wheels with a reinforced braking track.